My thanks to Amazon Vine for sending this book prior to publication. Set in 1890s France, The Killer of Little Shepherds contains two simultaneously-told stories. First, there's the account of Joseph Vacher, who roamed the countryside of France and left only gruesome death in his wake. The second story is that of Alexandre Lacassagne, head of the department of legal medicine at the University of Lyon, who pioneered many forensic techniques in the areas of crime-scene and post-mortem analysis, and was what we would now call a criminal profiler. Starr begins his story with army Sergeant Joseph Vacher's full-on obsession with a young woman named Louise Barant, a housemaid. After only one dinner, Vacher proposed marriage, and then later told her that if she ever betrayed him, he would kill her. She tried to avoid him and put up every reasonable excuse for not seeing him, but it didn't help. On a four-month leave from the army, Vacher came after her, she refused him, and he shot both Louise and himself. Both survived, and Vacher was put into two different asylums for a total of ten months, then released. With really nowhere to go, Vacher became a vagabond. As he wandered the countryside, he committed the most heinous crimes, with young shepherd boys and young women favorite targets. Because he would wander from department to department, by the time the crimes were discovered, he would have been long gone, thus avoiding detection. 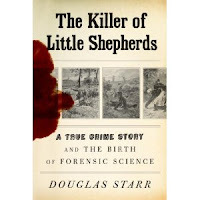 Starr then interweaves his account of Vacher with the story of Alexandre Lacassagne, who was a pioneer in the study of forensic methodologies, including criminal profiling. He also discusses others in the field of criminology including Alphonse Bertillon and Cesare Lombroso, and explains developments in science and psychology that aided in the advancements of legal medicine and crime detection. He also examines the phenomenon of "vagabondage," noting the correlation between unemployment, the increase of people on the move, and the correlating upswing in crime. Both strands of this book come together when Vacher is caught, imprisoned, and sent to trial, leading to some pretty major questions. For example, was Vacher insane at the time he killed, or was he perfectly rational? And what exactly legally constituted insanity? Is there any way to know if insanity is based on physical causes? What type of punishment is suitable if a murderer is found to be insane? Many of these questions sparked international debates, but they also led to further developments in the field of psychology, which was growing rapidly, as was the gap between medical science and legal codes. And when a person is known to be a "monster," even if he is insane, how can the legal system justify putting him in an asylum where, if he's crafty enough, he'd fake being well and be let out to kill all over again? Starr expertly catches the era surrounding the crimes of Vacher and the work of Lacassagne and others. He acknowledges work being done in other countries around the same time period, such as Italy, the United States and Great Britain so as to broaden the scope of developments in the science of criminology. He also examines other crimes as well as the limitations of the local rural police departments in the capture of criminals. I got very caught up in Vacher's story, and I liked the book. The early efforts focused on forensics and criminal profiling are really interesting, and if you're into this kind of thing, you'll be richly rewarded. It's quite obvious that Starr put in immense amounts of original research in the production of this work. The stories of Vacher's victims are also lurid enough so that if you're not interested in the field of forensic study, you'll still find something in the book that will interest you. I do think he could have done without the "postscript" chapter and gone right to the epilogue, but that's nit picky on my part. Overall, it's a good book that will keep you reading.